At the time of the 2010 census, Fort Myers had an approximate population of 62,298 residents. 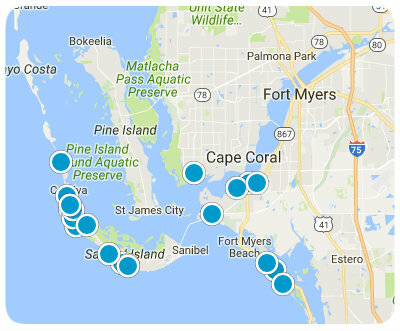 Fort Myers along with Cape Coral make up the Cape Coral-Fort Myers Metropolitan Area which has experienced tremendous growth in the last few years. Fort Myers has a total area of roughly 40 square miles of which almost 9 square miles is water. Fort Myers has a tropical savanna climate with short, warm winters and summers that are long, hot, and humid. Most of the annual rainfall occurs between July and September. The average low temperature in January is around 54 degrees. Children in Fort Myers attend schools in the Lee County School District. Several institutions of higher learning call Fort Myers home including Florida Gulf Coast University, Keiser University, and Hodges University, just to name a few. Condominiums, townhomes, single-family homes, and lots upon which to build your custom home are all available in the Fort Myers real estate market. Homes come in a variety of sizes and architectural styles to suit even the most discriminating home buyer. The average listing price for a condo in Fort Myers is about $229,381 and prices can go up to as much as $2,495,000. Fort Myers single-family homes have an average listing price of around $470,405 with prices going up to as much as $19,950,000 for one-of-a-kind, luxury mansions. The average listing price for a lot in Fort Myers is about $275,515 however, prices can go up to $5,500,000 based on lot size, proximity to popular water features, and access to amenities. Contact us today with any questions or to schedule an appointment to see any of our amazing properties in the popular Fort Myers area or any surrounding community.